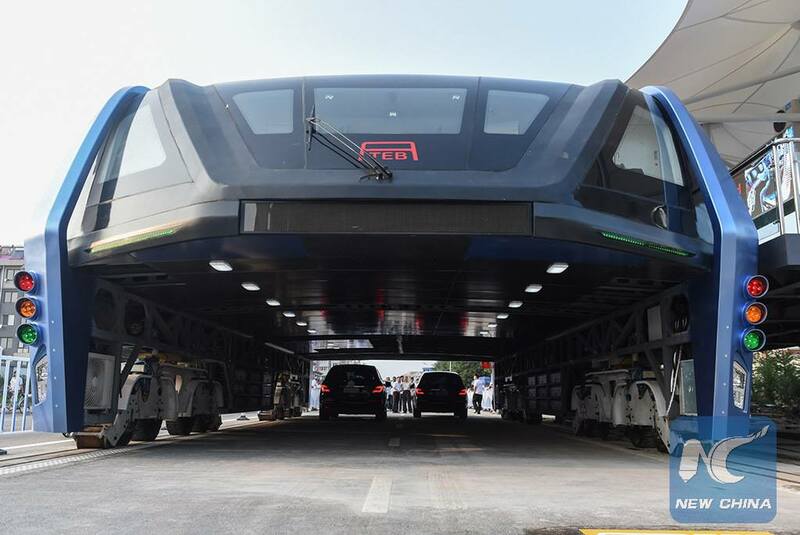 Last August, we wrote about a crazy elevated bus that straddles road traffic in the Chinese city of Qinhuangdao near Beijing. In the weeks that followed, we received reports from readers that something about the Transit Elevated Bus (TEB) wasn't quite right: while the vehicle did roll up and down the road a few times, it had since been abandoned in the middle of the street. In December, CNN reported that the TEB had been sitting on its test track in the city for months, gathering dust and causing traffic jams. So now, you may not be shocked to hear police in Beijing are saying it was all a scam. On Sunday, Beijing's Dongcheng district police bureau announced on Weibo that it had started an investigation into the company behind the TEB project—Huaying Kailai, an online investing platform not unlike Crowdcube. The police say they are holding more than 30 people, including Bai Zhiming who runs both Huaying Kailai and the TEB project. The Financial Times previously reported that the TEB was sold to private investors with a minimum buy-in of $150,000 and a promised annualised return of 12 percent. Earlier this year, Southern Metropolis Daily reported that 72 investors had filed lawsuits against Bai and Huaying Kailai; the Chinese newspaper said that, as of October 2016, Huaying Kailai had raised ¥9.1 billion (~£1 billion, ~$1.3 billion) in private investments. While this looks like a classic scam—raise money for a bad musical fictitious product, then run off to Rio—there's a small wrinkle. Quartz reported last week that local authorities in Qinhuangdao started to dismantle the TEB's track and to relocate the vehicle to an actual garage. In response, Bai Zhiming reportedly told Chinese media that the TEB would relocate to another city—hardly the kind of behaviour you'd expect from an accused scammer. In any case, it would appear that China's crazy elevated bus is dead for now (if indeed it was ever alive). While the TEB seemed like an awesome idea on paper, most of its advantages sublimed under scrutiny. Vehicles taller than 2.2 metres (slightly over 7 feet) had to find another route around the TEB. When the TEB turned a corner, every vehicle underneath had to wait for the manoeuvre to complete before going around the corner themselves. And no one had really worked out how to solve the issue of cars driving into the "legs" of the bus.